The very first thing to check are the policies of your trucking company. If they do allow pets, there may be an additional deposit or an extra cost to cover any additional cleaning due to the pet. If you get the okay, or if you’re an owner-operator, you should also consider state laws. Many states regulate pets traveling through, just to ensure that they are not bringing any diseases into the state. If you get pulled over, authorities will likely ask for a health certificate, proof of vaccinations, or something similar from your veterinarian. Do a little research during your trip planning and make sure to plan appropriately based on the states you will be traveling through. At the minimum, make sure your pet is up to date on vaccinations and gets a yearly checkup, and then carry a copy of the paperwork from your Vet. Your company may have rules regarding the types of pets you can take along, so be sure to ask. The most common animals that truckers travel with are dogs, followed by cats. Cats can be kind of finicky when it comes to riding in vehicles, so make sure your pet can handle it before a long trip. You also have to plan for the logistics of a litter box in the truck. When it comes to dogs, the breed is really up to you, but as a general rule, larger dogs need more space and exercise, and will need bathroom breaks more often. Plus, larger dogs eat more food. Also, consider the breed; how much exercise they’ll need and you can provide, grooming necessities and overall maintenance. Tips: Animal Planet has a decent Dog Breed Selector tool to help narrow your options. You could also ask your Vet for their opinion. When deciding what pet to bring along, just be realistic with yourself based on your ability to care for the animal and the size of your rig. If you happen to have an exotic animal such as a bird or snake then you’re probably getting in over your head if you choose to take them along. You already plan your trips, but you have a lot more to consider when taking a pet along. Aside from company rules, state regulations, and the type and breed of pet, you should also plan pet-friendly stops along the way. It is also a good idea to learn where veterinary services are along your route. 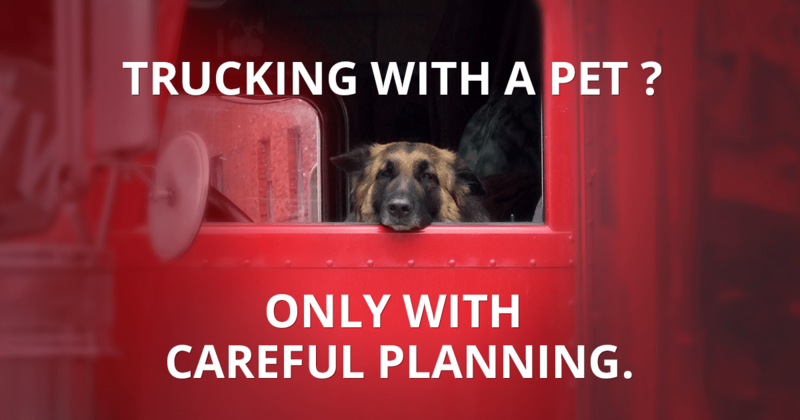 A pet can help in alleviating the solitary nature of trucking, but the safety and care of your furry friends should be an absolute priority. Fortunately, with careful planning, you can safely have a little company for those long hauls. Hunter Tires sells quality affordable semi tires. Content on this website is provided for informational purposes only as stated in the Terms and Use of this website.